Shamokin Dam - Debbie Benner grew up eating Biff-Burgers. She usually orders the special, such as the Super Biff with cheese and fries she had just finished eating Friday for lunch. “This is the only place I will eat a burger”, the Shamokin Dam woman said. “I will be sad when this place goes out”, said Benner, a regular customer. The Routes 11-15 site of the Biff-Burger, the first fast-food restaurant that opened along the so-called “strip”, is up for sale. 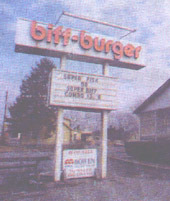 Leon Pontius of Hummels Wharf opened Biff-Burger in 1966. Art Bowen of Bowen Agency Inc. said the real estate has been for sale for about a month. Bowen, the listing agent for the property, said he is assembling a larger tract that includes the Biff-Burger site. He has put together three parcels of land that front along Routes 11-15 and three lots in the back. The Biff-Burger site is in the middle of the three tracts. “We’re assembling the land behind it all the way to the back alley. This is so a larger user can come in and look at it”, Bowen said. The combined frontage of the three tracts is 375 feet along Routes 11-15 in Monroe Township. Bowen said the property could become home to a business such as a motel or a restaurant. He understands Cam Forrey, the owner of Biff-Burger, plans to retire if the property is sold. “It could take one, two or three years for it to sell. It’s not like there are plans to close right away. She plans to stay open”, he said. Bowen said he served as the listing agent when the property was sold by Dave Karchner of Hummels Wharf to Forrey. He said there are potential buyers that he will be talking to “but nothing (is) firm at this point in time”. Forrey on Friday referred questions to Bowen.